in vivo-jetPEI® | Tamar Laboratory Supplies LTD. The easiest delivery method for in vivo proof of concept. in vivo-jetPEI® is a powerful polymer based reagent used to deliver any nucleic acid to any animal model. The protocol is similar to a classical transfection: just mix and administer. in vivo-jetPEI® forms stable complexes with the nucleic acid, protecting it from degradation and thus facilitating in vivo delivery. With a proven track record (over 200 Publications), in vivo-jetPEI® has already been used to target many organs using many administration routes. 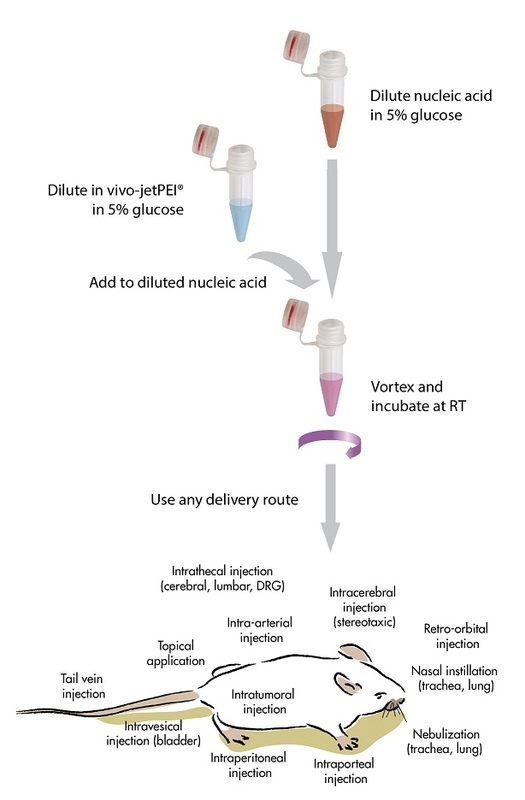 With 0.1ml of in vivo-jetPEI® perform up to 20 intravenous injections in mouse with 50 µg of nucleic acid. The glucose solution is required to form nucleic acid/in vivo-jetPEI® complexes adapted to in vivoinjections. Bulk quantities and GMP grade are available upon request.